New at Mosaic Art Supply! See our Sales & Close-outs for great deals! Shop by Color! Browse materials by color and find what you need more easily. Back In Stock: Irregular Ceramic Shapes in assorted colors. Black & White Glass Tiles in many styles! Morjo™ 12mm Recycled Glass Tile is available in the intense, eye-catching colors required for a mosaic art piece. Also available in 12mm Iridescent and 8mm. Colored Glass Mirror Tile is a colorful, architectural quality material with a fused metallic backing. Our Chunky 15mm Porcelain Mosaic Tiles are a durable stone alternative. Morjo™ 12mm Recycled Glass Tile comes in amazing colors and cuts like butter into tiny cubes with minimal scrap. New colors of Stained Glass in 6-inch Sheets for Mosaic Art & Craft projects! Our Colored-Glass Mirror Tile is architectural quality with silver fired directly into the glass, which is colored glass instead of color coated. Check out our latest Sales & Close-outs for great deals! 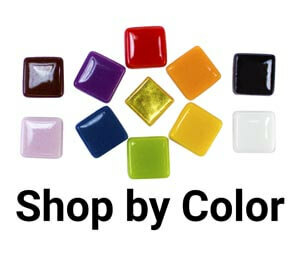 Shop by Color! Browse materials by color and find what you need easier. Gemstones Restocked! Natural stones available in Rough and Polished. Soft Glass Shapes are clear glass shapes with rounded tops and flat bottoms. NEW 5/16 Inch Coaster Bases made from cherry hardwood right here in the USA. These awesome materials are our Rough Cut Millefiori & Ceramic Charms. Morjo Vitreous 3/4″ Glass Tile Restocked in All Colors! New! Irregular Ceramic Shapes in assorted colors. Kits and Tools with New Lower Prices! 24k Real Gold Mosaic Tile! Millefiori Glass is a traditional form of art glass that is disk-shaped with different multicolored patterns and is used in glass fusing, jewelry and mosaic art. We have two different types in this category: the beautiful yet affordable Millefiori by Mud-Turtle Mosaic™, and Translucent Millefiori Gems.